This week, EWG released our 2019 installment of the Shopper’s Guide to Pesticides in Produce™. The major stories coming out of this year’s guide were strawberries topping the Dirty Dozen™ list once again and the meteoric rise of kale up to third on the Dirty Dozen list. Kale's ascension was due to Department of Agriculture testing data that shows the presence of the potentially cancer-causing pesticide Dacthal in more than half of the samples, even after they were thoroughly washed. Landmark legislation was introduced this week in California that would ban the use in cosmetics sold in the state of 20 highly toxic chemicals known to cause cancer, reproductive harm or hormone disruption. 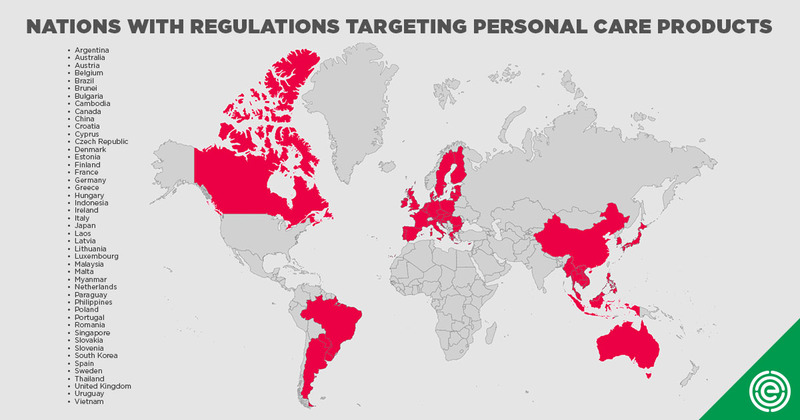 EWG also analyzed global regulations on cosmetics and personal care products and found that more than 40 countries have regulations for these products on the books, but the U.S. does not. This country could join the list soon if recently introduced federal legislation is passed that gives the FDA more power to review and, if needed, regulate or even ban chemicals of concern. Source: EWG, from the EU, ASEAN, MERCOSUR, Japan, Australia, South Korea and Canada. EWG recently submitted a Freedom of Information Act request to the Department of Defense, seeking information on how many current and former military installations have ground and surface water contaminated by toxic fluorinated chemicals. In response, the Army requested the whopping sum of $300,000 for the data. This week, EWG filed an administrative appeal of the Army’s fee request. Also this week, a jury in California ruled in favor of a plaintiff who was suing Monsanto and Bayer AG, arguing that glyphosate, the main ingredient in Monsanto’s Roundup weedkiller, was the cause of his non-Hodgkin lymphoma. In additional glyphosate news, Los Angeles County announced on Wednesday that the weedkilling chemical would be banned from further use by all county departments. Federal legislation was introduced this week that aims to stomp out asbestos from personal care products. And finally, the Environmental Protection Agency dropped a confusing rulemaking on notorious carcinogen formaldehyde this week. Experts at EWG interpreted EPA’s actions as an attempt to delay restrictions that can be put in place to regulate the cancer-causing chemical. Strawberries, spinach and kale top "dirty dozen" list: How to minimize pesticide intake. The ranking, dubbed the Dirty Dozen, is released each year by the Environmental Working Group. The nonprofit consumer advocacy organization uses more than 40,000 produce samples tested by the Food and Drug Administration and the U.S. Department of Agriculture in compiling its list. You've long been told to eat your fruits and veggies - the government's new food guidelines even recommend filling half your plate with them. But pesticide residues can pose a health risk - so watch out when you consume the fruits and veggies on the Environmental Working Group's latest "Dirty Dozen" list of most contaminated produce. Keep clicking to see which produce item is the dirtiest of them all. Often touted for being highly nutritious, kale has joined the list of 11 other fruits and vegetables known to be “dirty,” according to an analysis by the Environmental Working Group. Reprinted by NECN, NBC4 (D.C.), NBC New York, NBC Boston, NBC Chicago, NBC Los Angeles, NBC San Diego, NBC Miami, and 18 other media outlets. Each year, the Environmental Working Group releases a "Dirty Dozen" list of fruits and vegetables that contain the highest level of residual pesticides as noted in government tests. Past Pesticide Data Program reports issued by the US Department of Agriculture indicated that when pesticide residues are found on foods, they are nearly always at levels below the human tolerance limits set by the US Environmental Protection Agency. Every year, the Environmental Working Group releases a list of the ‘Clean Fifteen’ fruits and vegetables. For 2019, avocados top the list of produce that contain the least pesticide residue. Kale, strawberries and spinach top the Environmental Working Group’s list of the 12 fruits and vegetables with the most pesticide residue. The list, called the Dirty Dozen, is released each year by the nonprofit consumer advocacy group. Reprinted by The San Diego Union-Tribune. Kale ranked third on the Environmental Working Group’s list of fruits and vegetables with the most pesticide residues. That was a big jump for the leafy green, which hasn’t appeared at all on the list since 2009. Hate kale? You might enjoy this. A new report from the Environmental Working Group (EWG) suggests that the leafy green is one of the most pesticide-covered produce items at the supermarket. Reprinted by People en Espanol and Yahoo!. Each year, the Environmental Working Group (EWG) publishes its Dirty Dozen list, which ranks the 12 pieces of produce that contain the highest amounts of pesticide residues. The Environmental Working Group recently published its annual list of the most pesticide-heavy produce, as well as those that have fewer pesticide residues. Choosing organic produce can help, too. Unless you’re buying organic, there’s probably more pesticides present on your fruits and veggies than you’d think. The Environmental Working Group (EWG) just released their 2019 Dirty Dozen list, which shows which fruits and veggies are the most contaminated with residues from pesticides according to research by the U.S. Department of Agriculture. If you regularly eat kale, it might also be a good idea to make sure you wash it thoroughly. The Environmental Working Group just released its “Dirty Dozen” list for the year, which is a guide to the products that are covered in the most pesticides. It found that kale had the highest pesticide residues compared to nearly all other produce found on supermarket shelves in the US. Reprinted by This is Insider and 12 other media outlets. Strawberries, spinach and kale claimed the top three spots of the Environmental Working Group's (EWG) annual Dirty Dozen list, which ranks the most pesticide-heavy produce. If you're going to buy organic, strawberries, spinach, kale, nectarines and apples might be a good place to start. Those are the top five U.S. fruits and vegetables most tainted with pesticides, according to the annual Shopper's Guide to Pesticides in Produce report from the nonprofit Environmental Working Group. On Wednesday, the Environmental Working Group released its annual Shopper's Guide to Pesticides in Produce, which analyzes Department of Agriculture test data to identify which supermarket produce have the most --and least-- contamination. Researchers said they were shocked that kale made the list this year. Not only does kale rank third in the Environmental Working Group's (EWG) annual report, but it actually has higher pesticide residues than nearly all other produce found on supermarket shelves. Yikes! About 70 percent of U.S. produce retains pesticide residues even after washing, according to a new study by the Environmental Working Group (EWG). Kale ranked as a third-worst fruit or vegetable behind strawberries and spinach when it comes to pesticide contamination, according to the Environmental Working Group’s annual “Dirty Dozen” report. Over 92% of kale samples were found to have two or more pesticide residues — and a single piece of kale could have up to 18 pesticides on or in it. Reprinted by MorningStar. Kale came out of nowhere on this year’s Dirty Dozen after not making last year’s list at all. The Environmental Working Group (EWG), a nonprofit organization focused on human health and the environment, has produced the report annually since 2004. The entire list, which includes peaches, cherries and nectarines, can be found here. But what’s up with kale? Reprinted by East Bay Times. The list was published Wednesday by the Environmental Working Group (EWG), a nonprofit, nonpartisan environmental organization, as part of its annual “Shopper’s Guide to Pesticides in Produce.” The guide also includes a “Clean Fifteen” list — the fruits and veggies least likely to be contaminated with pesticides. Each year, the American non-profit research organization Environmental Working Group releases its “Dirty Dozen” list, featuring fruits and vegetables that rank highest in pesticide residue. After years as clean eating’s poster child, kale is now on the Dirty Dozen 2019, an annual list of the most pesticide-ridden fruits and vegetables, released Wednesday by the Environmental Working Group (EWG). Reprinted by FOX News. Thinking of digging into a kale salad at lunch today? You may want to think twice. According to the health advocacy organization the Environmental Working Group, the popular leafy green has higher pesticide residue than almost all produce that’s found at the grocery store. Reprinted by the Bend Bulletin. If you're trying to eat healthy but save money, a good rule of thumb has been to splurge only on organic produce that notoriously contains large amounts of pesticides. The Environmental Working Group (EWG) makes this easier by releasing a list every year called the “Dirty Dozen,” which names the 12 pieces of produce that contain the most pesticides. Stick to EWG's “Clean 15” list for everything that's OK to buy nonorganic. Reprinted by Yahoo! News. But how do you choose the most crucial fruits and vegetables to seek out? Well, a 2019 report from the Environmental Working Group (EWG) is breaking down the top pesticide-ladened produce—known as the Dirty Dozen—to help steer you in the right direction. Each year, the nonprofit Environmental Working Group (EWG) releases the Shopper’s Guide to Pesticides in Produce so customers can figure out where to spend extra for organic and which fruits and veggies are safe to buy conventionally grown. When it comes to eating healthfully, it's become common knowledge that we should be stocking up our plates with fruits and vegetables. But not all produce is made equally, it turns out. In fact, the Environmental Working Group's 2019 list of fruits and veggies with the most pesticides has been released and it includes many meal-time staples. The Environmental Working Group (EWG) just released its rankings for the 2019 Dirty Dozen, a guide to pesticides and produce. Kale finds itself on the list for the first time since 2009, ranking third, right behind strawberries and spinach. Every year, the United States Department of Agriculture (USDA) tests 47 popular fruits and veggies, mimicking how a typical person might prepare produce at home. BIG 96.3 (Ontario, Canada):'Dirty Dozen': Do these fruits and veggies really have harmful amounts of pesticide? Shopping trips always bear interesting results for the Environmental Working Group. It's become a frequent occurrence: EWG purchases groceries and tests them for pesticides. And the tests frequently show the presence of pesticides. It’s one of the trendiest greens on supermarket shelves and turns up in salads pasta dishes and even smoothies. But a new report from the Environmental Working Group finds the leafy green kale contains more pesticide residue than most other kinds of produce. ABC4: KITV (Honolulu, Hawaii. ): Strawberries top the list of dirtiest produce in the U.S.
Strawberries are one of the dirtiest produce in the U.S. The Environmental Working Group released its "Dirty dozen" list of fruits and veggies. ABC5: WCVB (Boston, Mass. ): What is 'organic'? Trying to eat healthier can be overwhelming, but there are some helpful tools that can make it easier. The Environmental Working Group issues a list every year to help consumers reduce their exposure to pesticides from produce. The Environmental Working Group has released its "dirty dozen" list of fruits and vegetables. Strawberries came in first, meaning they're the item most tainted with pesticide residue. Just how safe is the food in your kitchen? The Environmental Working Group released its annual “Dirty Dozen” list of fruits and vegetables. The list includes the top 12 veggies and fruits found to have highest amount of pesticide residue. Reprinted by ABC7 (Chicago, Ill.), ABC13 (Houston, Texas), ABC28 (Tampa Bay, Fla.), ABC30 (Fresno, Calif.) and 11 other ABC affiliates and Yahoo! News. The Environmental Working Group has released it's annual list of fruits and vegetables that are most likely to contain pesticides known as “The Dirty Dozen”. Reprinted by 8 E.W. Scripps TV stations. The Environmental Working Group released its Dirty Dozen list of fruits and vegetables with the most pesticide residue. According to a newly released report from the Environmental Working Group, nearly 70 percent of the produce sold in the U.S. come with pesticide residue. In case you’re wondering, all of the produce was washed and peeled, just as someone would do when preparing the food at home, proving, the Environmental Working Group says, that simple washing does not necessarily remove all pesticides. Reprinted by WDIV (Detroit, Mich.). WJAX (Jacksonville, Fla.), WKMG (Orlando, Fla), WSLS (Roanoke, Va.) and 4 more Graham Media group stations. Kale, that popular green of the health conscious consumer, has joined the list of 12 fruits and vegetables with the most pesticide residues, according to the Environmental Working Group. Reprinted by CBS Baltimore, CBS Chicago, CBS Houston, CBS Los Angeles, CBS San Francisco and 15 other local CBS stations. CBS2: WLNY (New York, N.Y.): Is There Dirty Produce In Your Kitchen? The "Environmental Working Group" has revealed its list of produce covered with the most pesticides. Data from the U.S. Department of Agriculture shows that kale is one of the top crops affected by pesticides. The leafy green vegetable has been placed at the number three spot on the Environmental Working Group’s “Dirty Dozen” list. “Studies link pesticides to a host of human health problems including brain and nervous system toxicity, also hormone disruption, even cancer have been linked to pesticides,” said Samara Geller of Environmental Working Group. Bad news for Popeye the Sailor Man.....it turns out there is a lot of pesticide. The Environmental Working Group released its "dirty dozen" list of fruits and vegetables. Strawberries came in first -- meaning they're the most tainted with pesticide residue. Spinach and Kale are in second and third place. You might want to rethink that kale smoothie, because the popular vegetable that serves as a staple in “clean eating” meal plans just made it onto the Environmental Working Group’s annual ranking of the most pesticide-ridden fruits and vegetables, otherwise known as the “Dirty Dozen.” Reprinted by FOX11 (Los Angeles, Calif.), FOX2 (Detroit, Mich.), FOX7 (Austin, Texas), FOX10 (Phoenix, Ariz.), FOX32 (Chicago, Ill.), and 10 other local FOX stations. According to a newly released report from the Environmental Working Group, nearly 70 percent of the produce sold in the U.S. come with pesticide residue. Reprinted by Tegna stations NBC9: KUSA (Denver, Colo.), NBC10: WTSP (Tampa, Fla.), NBC12: KPNX (Phoenix, Ariz.), NBC23: KAGS (Bryan, Texas), and 35 other affiliates. According to the Environmental Working Group, they are the top three items containing pesticides. According to the report, early 70 percent of the produce sold in the United States contains pesticide residue. The Environmental Working Group released its "dirty dozen" list of fruits and vegetables. Strawberries came in first -- meaning they're the most tainted with pesticide residue. Spinach and Kale are in second and third place. Reprinted by 17 Nextstar Media stations. The Environmental Working Group has released its "Dirty Dozen" list of fruits and veggies. According to the list, strawberries came in first, meaning they're the item most tainted with pesticide residue. The language in the Keep Food Safe from Glyphosate Act is similar to arguments made by the Environmental Working Group, which is well known for its annual Dirty Dozen report — a list of food with high levels of pesticide residues. Critics say the EWG is nothing but a lobby group for the organic food industry. In 2018, the nonprofit Environmental Working Group (EWG) discovered traces of glyphosate in dozens of Quaker, Kellogg's, and General Mills products, including cereals like Cheerios and Lucky Charms. Reprinted by SFGate, Seattle PI, The Telegraph and 22 other media outlets. Environmental advocates were quick to celebrate the verdict. Ken Cook, the president of the Environmental Working Group, said the ruling supported previous conclusions that “glyphosate causes cancer in people”. Reprinted by Yahoo! Finance and Daily Magazine. Samara Geller is interviewed in the segment. “They would have to demonstrate to the FDA that they used a very refined method to test for the presence of asbestos,” Scott Faber, senior vice president of government affairs at the nonprofit watchdog Environmental Working Group told MarketWatch. He said companies would also have to show that their cosmetics were free of the toxin under the bill. Reprinted by MorningStar. Washington Examiner: Set for a makeover? A recent report by the Environmental Working Group (EWG) found that U.S. regulation of chemicals and contaminants in cosmetics dramatically falls behind 40 other nations. “Many cosmetics companies are already reformulating their products to exclude these dangerous chemicals, but it’s important to establish a floor other companies can’t drop below,” Ken Cook, president of Environmental Working Group, one of the bill’s sponsor, said in a press release. “Toxic chemicals that cause cancer or reproductive harm have no place in any consumer products, especially those that adults and children alike apply to their bodies every day,” said Susan Little, senior California advocate for government affairs of the Environmental Working Group. But the Environmental Working Group criticized the administration for making "a significant retreat" and not extending the ban to commercial uses. EWG attorney Melanie Benesh accused the administration of "catering to the wishes of the chemical industry. But the Environmental Working Group characterised the move as “confusing and deceptive”. “Under the guise of taking action, the decision likely will have the effect of delaying further restrictions on its use,” said EWG legislative attorney Melanie Benesh. In a March 12 letter, the Army told the Environmental Working Group, an advocacy group, that the military would charge the group $290,400 to provide records of water tests at 154 installations for a family of compounds known as PFAS, which federal authorities say appear linked to certain cancers and other health and developmental problems. Reprint from the New York Times, Washington Post, San Francisco Chronicle, SFGate and 303 other media outlets. At that level, the military could avoid paying to clean up many contaminated sites across the nation, said David Andrews, senior scientist for the Washington D.C.-based Environmental Working Group, an advocacy group. The Associated Press: Army Bill For Public Records On Contaminant: About $300,000. The U.S. Army has put a price tag on releasing the results of water tests for a dangerous contaminant at military installations: nearly $300,000. In a March 12 letter, the Army told the Environmental Working Group, an advocacy group, that the military would charge the group $290,400 to provide records of water tests at 154 installations for a family of compounds known as PFAS, which federal authorities say appear linked to certain cancers and other health and developmental problems. The U.S. Army is asking the Environmental Working Group for $290,400 to execute a public records request seeking data from 154 installations where water is contaminated by PFAS. In a letter dated March 12 and reported by the Associated Press, Army senior counsel Paul DeAgostino wrote that the green group's fee waiver request was denied. In a 2018 paper, Environmental Working Group researchers found that the USDA’s efforts to encourage Midwestern farmers to plant and maintain grass to avoid gully erosion have largely failed. One of the most worrying substances when it comes to hormone disruption in pollution is bisphenol A (BPA), a chemical that is used to harden plastics. The Environmental Working Group told LiveScience that BPA is in a lot of products we use regularly, particularly plastics and canned food. Accuweather: How are spring cleaning products hurting the environment, your health? If you want to check out your own products and look for better alternatives the EWG Guide to Healthy Cleaning can give you ratings on cleaning products. But according to Samara Geller, senior research and database analyst for the Environmental Working Group (EWG), oven cleaners are “especially hazardous.” It has to do with the ingredients used in oven cleaners, she told The Daily Meal. Reprinted by Yahoo!. You can also check the EWG’s lists of safe cosmetics and cleaning products. VOGUE India: Why are more skincare and makeup brands now focusing on clean beauty? The Environmental Working Group in the US reported that women are now exposed to a daily average of 126 chemicals from cosmetics, food, cleaning supplies and pollution. Herbal Essences: The Environmental Working Group verified Herbal Essences’ recent clean shampoo collection, Bio:Renew, in January 2019, marking it the first-ever mass-market shampoo to hold the status. The Environmental Working Group, using data they obtained through a FOIA request of USDA, reports that from 1995 to 2017, the largest 10 percent of subsidy recipients received 54 percent of all subsidies averaging more than $1 million over the period. At 680° F, Teflon releases at least six toxic gases, including two carcinogens, according to a study by the Environmental Working Group, a nonprofit watchdog organization. Made with 20 percent natural zinc oxide, this sunscreen has earned a prestigious number one rating from the Environmental Working Group's Skin Deep database for its non-toxic, hypoallergenic formula, and eco-friendly performance. Plus, because it's reef-safe, it's great for the ocean, too. The US NGO Environmental Working Group (EWG), which has published an annual sunscreen guide for the past 12 years, says oxybenzone is a potential hazard to both the environment and human health. Garnering an “excellent” rating from the Environmental Working Group (EWG) for high UV protection and low toxicity, MDSolarSciences Mineral Crème Broad Spectrum SPF 50 Sunscreen is a hypoallergenic, non-comedogenic sunscreen that has an SPF of 50, thanks to its 17 percent zinc oxide and 2 percent titanium dioxide. The nonprofit Environmental Working Group manages a database that collects local water reports and EPA reports. If you look up San Antonio water on EWG’s website, it says there are nine contaminants detected above health guidelines. The Environmental Working Group works nationally on PFAS and took a broader swipe at the EPA. “Over the past two decades it has become clear that the federal government is unable to incorporate modern science into its existing regulations and is unable to set any new drinking water regulations,” senior scientist David Andrews told Great Lakes Now. Newsday: Opinion – Is it safe to drink American water? The recent EPA report shows that PFAS were found in all 50 drinking water supplies that it tested — an alarming increase from a similar 2016 study that found PFAS in fewer than 3 percent of samples. Meanwhile, the Environmental Working Group issued a report stating that up to 110 million Americans could be drinking contaminated water. Reprinted by Inside Sources.